Lightning STRUCK: Stocks BUBBLE Ends HERE! That’s it for stocks. With today’s letter, my purpose is to make sure you’re prepared. I hold a private pilot license, and as you know, take-off and landing are the two most challenging aspects of flying. Stocks, like a plane, took-off on March 2009, and apart from some minor setbacks, they’ve been cruising at high altitudes, above the clouds, free from the worries caused by geopolitical events, leveraged debt, and a colossal derivatives market, all casting a huge shadow on the future of the global economy. Now, this plane (the stock market) seeks to land (top-off and reverse into a bear market), but since its engine is so outdated (ungodly debt levels), and it carries too much weight (budget deficits), look out for an emergency landing (25%-30% drop in prices). The way I see it, the plane just received fuel in mid-air (lower taxes) and can circle around a bit more (companies are cashed-up), but even fuel can’t save it for long. Stocks are officially entering the final leg. Interest rates are now fully rising, and that’s what investors in stocks know ends bull markets. Here’s why – in the short-term, stocks are riskier than bonds. So, for investors to consider buying equities over bonds, they want to see more attractive prices (better risk premiums). You see, the higher the rate is on the “risk-free” Treasury bond, the more selective stock investors become, since they now have alternatives. But, it’s not only that – we’re actually at the end of the cycle for corporate profits (they’re peaking), and as you know, what ultimately dictates prices for all assets, are their profits. 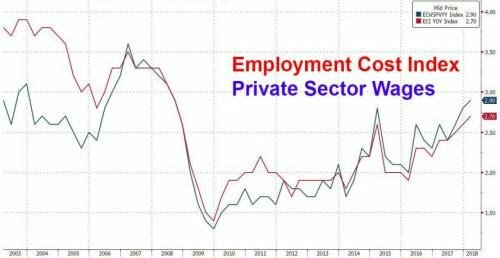 The U.S. economy is hitting full employment right now. This chart shows initial jobless claims. Examine it, think about what it means, and you’ll realize that though baby boomers are exiting the workforce, companies can replace them because they’re growing faster now, and millennials are desperately looking for stable jobs. Naturally, more people working means more income goes to Main Street America, so that’s an important change, especially with lower taxes. For us, as investors, though, it means businesses are seeing rising costs for salaries, which shrink their bottom-lines. It also means that prices are rising for their supply chains. An overheated economy, like an overheated plane engine, needs a break. Think about a pilot, who pushes the throttle all the way through for too long, to get to his destination quicker, but causes the temperatures to reach the danger zone. As much as he wants to keep going at record-breaking speed, the eternal laws governing cycles and performances are catching-up to him. Labor costs are rising fast. It is starting to resemble the years before the Great Recession, and like any world-class racing pilot, it is now a balance between his desire to safely reach his final destination (juice more profits from the market) and his conflicting desire to make it before the fuel runs out (be in liquid cash when it finally tops). Rising labor costs are the final nail in the coffin of a business cycle – nothing the government or the Central Bank can cook-up will arrest the power of the free market. So a stock market peak, an ensuing recession, and slower economic activity are coming, not because the plane is not fit to fly anymore, but because it requires maintenance (economies have to cool-off). After a month in the shop, it will be ready to go again (the bear market or the sideways market will not be a prolonged one). During its time at the hangar, though, where its engine is worked on, people still need to get from point A to point B, or in investment terms, money still needs to be made, even when the broad indices (S&P 500, Dow-Jones and NASDAQ) are underperfoming, so investors will look at available planes (undervalued assets). You can’t find a bigger bargain than commodities – it’s the plane, which hasn’t taken-off in years. Jumping from plane to plane isn’t smart in mid-air, but doing it while on the ground makes perfect sense. In other words, investors have been making big-money with tech stocks for years, so only now, as they begin to struggle, the motivation to explore other industries emerges. The reason Wealth Research Group is finally using the term bubble to describe the current conditions is that investors have leveraged; though, they now need to dump weight for the plane to remain airborne (investors are continuing to borrow against equity to buy expensive stocks). They want to keep flying, without paying the cost. This is why ground control’s warnings are now being taken more seriously by the passengers and the pilot. The stock market has one last tank to empty out (tax cuts have created record earnings); then, it’s time to land or crash, but whatever happens, the stock market is not going to rally for a while, after this last burst of energy is used up. 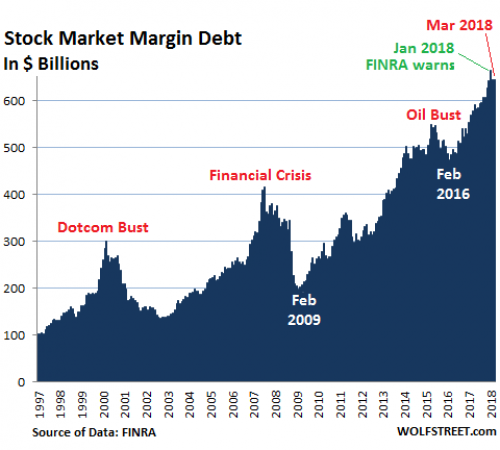 In the coming months, then, I expect a final stock market rally, as the margin debt levels are high. What could end the rally sooner than expected is a surprise hike in May, which only 34% of investors are currently betting on. BLOCKCHAIN UPDATE: EOS – TOP ALTCOINS 2018! On January 5th, 2018, we profiled EOS as our No.2 ranked altcoin to accumulate this year. The price was $10.58 per coin back then. As you can see, it has been resilient during the crash and has more than doubled since bottoming. Today’s price is close to $21, so we’re up big – OVER 100% AND COUNTING in less than four months. A major consulting firm named deVere Group is now predicting ETH prices to reach $2,500 by year-end, so that is huge for Ethereum miners as well. With the cost of mining becoming stable and even shrinking, thanks to electricity efficiencies, any price increase immediately creates leverage for the net margins. The crypto plane survived an emergency landing in January and February and looks to be taxing to the runway for a second takeoff soon.